Who Pays The Buyer’s Agent Their Fee/Commission? 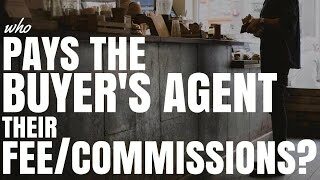 Who Pays The Buyer’s Agent Their Fee/Commission? There are also buyer’s agents who charge fixed fees of around $5,000 to $15,000 and it really just depends on the buyer’s agent that you go with. But at the end of the day you are going to be paying the buyer’s agent if you are the buyer because the buyer’s agent is working for you in order to help you find, research and purchase a successful property that may be your home or maybe an investment property. So they are working for you, they are generally not getting a commission on the sale of the property and so therefore they are just getting paid by you so they are working for your interest therefore they need to be paid and generally they are going to be paid by you. This fee is almost always paid out of your own pocket. It is going to be very difficult to get a loan in order to hire a buyer’s agent. Generally what will happen if you are trying to get a loan to hire a buyer’s agent is that is going to lower the amount of deposit that you put into your property, it is going to increase your loan amount, lower your loan-to-value ratio. It is just basically the same as paying it out of your own pocket anyway so most of time you are going to be paying a buyer’s agent yourself out of cash that you have in your pocket. There are some circumstances where you have already purchased investment properties or you are leveraging equity out of your home or an investment property, in this case you may be able to leverage that, get an equity loan and use part of that equity loan to pay the buyer’s agent in order to purchase your next investment property. So in most cases you are going to be paying it with your own cash however if you are acquiring an equity loan to extend your property portfolio then you may be able to pay the buyer’s agent from a loan, taking cash out of your own pocket. There are some circumstances where a buyer’s agent will receive a commission as well from the developer or the builder. This is generally when you buy a new build property; you are buying land and you are going to build a house on it or townhouse or units or whatever it may be. Now from my understanding it is generally not really disclosed to you how much they are getting in these and it is not really stated as a referral fee for them taking you as the buyer and purchasing this property but generally that works with developers and builders to charge them for something. So this might be a marketing cost or it could be a project management cost or it could be a myriad of other things that they decide this is what they are charging for and so most buyer’s agents would just get charge by the people they are helping however some buyer’s agents do also get a fee from the developers or from the builders. Developers and builders are used to this, they are used to going to property marketers, providing them with commissions in order to sell property and so that is very common for buyer’s agents when they are helping you buy house and land package for the developers to pay or offer them something so it is very easy for them to say yes on that behalf. So try and talk to your buyer’s agent and see that they are charging for that. It is one of the reasons that I like to recommend Ben Everingham from Pumped on Property, who is my number 1 recommended buyer’s agent, is because he is very transparent about how he makes money. He only gets fees from the buyers and if there are instances where there is a development fee, he clearly states that to you and there probably is some benefit for you in that as well. He is super transparent which is what I expect from someone that I partner with and deal with and recommend to you guys, his complete transparency. You guys need to know what you are getting. You need to know that he has your best interests at heart and so that is why I recommend him. If you want to check out the buyer’s agents that I recommend, simply go to onproperty.com.au/buyersagents and you can check them out over there. Basically in most circumstances the buyer’s agent is going to be paid by you. There are some circumstances that they are paid by you and by the developer or the builder but it will show up as a line item that you do not really know about because technically I do not think they can be paid by both parties for the same service. They can be paid as a buyer’s agent to help you find property and as a seller’s agent to sell property because that is an obvious conflict of interest. That is why they charge marketing cost, they charge project management or something like that. and if you are looking at free buyer’s agents or free property advisors or free property marketers, in almost all cases they are paid by the developers and the builders their commission and so they are not paid by you. For me this is a massive conflict of interest, they are being paid by the developers to sell property stock so it is in their interest to get the highest price for the developers and builders. It is not in their interest to help their investor that they are pitching they are going to be their property mentor but they are actually getting paid by someone else. So I do prefer buyer’s agents because they get paid by you. And I do recommend that if you are going to work with someone to help you buy property then you hire someone who you are paying and who has your best interest at heart. I hope this has been helpful and answered your question who pays the buyer’s agent their fee or commission. I am Ryan from onproperty.com.au, helping you find positive cash flow property. And if you want to check it out I have a list of 10 high rental yield properties with a good chance of generating a positive cash flow. You can see those listings absolutely free by going to onproperty.com.au/free to check that out.